Coles has launched a new free mobile payment system that allows Coles MasterCard customers to pay for their shopping using their iPhone or Android smartphone. In another big step for the retailer into the financial services space, Coles has also announced a joint venture with GE Capital. The mobile payment technology uses a small Coles Pay Tag card, which customers can stick to the back of their mobile phones. The tag connects to the more than 320,000 PayPass contactless payment terminals across the country. 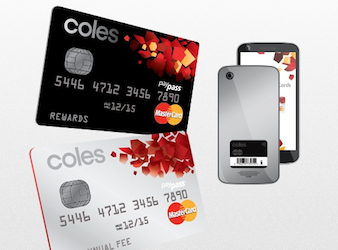 After a successful trial in February 2013, the company is now rolling out the Coles Mobile Wallet free to customers with the company’s branded MasterCards. 77% of trial participants said they found the smartphone mobile payment more convenient than using a traditional credit card. Coles Mobile Wallet customers can also accrue FlyBuys points and they will receive exclusive FlyBuys offers. The app provides access to account balance and transaction history. MasterCard Australia’s Andrew Cartwright said Australia was leading the way in contactless technology payments, with half of transactions below $100 now using the technology. MasterCard’s PayPass allows customers to make card purchases of less than $100 without inputting a pin number. Other services, such as Visa PayWave, offer similar convenience. “The Coles Mobile Wallet follows the success of MasterCard’s PayPass technology, and is testament to the growing appetite of Australians for fast, simple and secure payment methods,” Cartwright said. The new Coles Pay Tag offers the same protection against fraud as its existing cards. The app also offers extra security with the option to turn the payment function on and off. “We understand that Coles customers are doing even more from their mobile devices – whether that be surfing for recipes or managing their finances. With this in mind, it is exciting to launch the Coles Mobile Wallet which puts customers in control of their spending and introduces Australians to an entirely new way to pay. “Now partnered with the new app, the Coles Mobile Wallet will provide functionality, a seamless user experience and instant rewards – unlike any other credit card in the market,” Wormald said. Coles has also announced today a 50:50 joint venture financial services business with GE Capital Australia that will offer credit cards and personal finance products. The business will commence operations during 2015, subject to obtaining the relevant regulatory licenses and approvals. The existing 400,000 Coles MasterCard customer accounts will form part of the new joint venture, representing close to $800 million in credit card receivables. Coles Insurance products including motor, home and life insurance will remain separate. The joint venture will leverage new payment technologies including the Coles Mobile Wallet, as well as allowing customers to take advantage of the company’s successful Flybuys loyalty program.